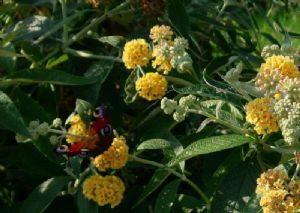 This yellow-flowered buddleja is a cross between the davidii and globosa types - giving long panicles of flower that go on through late summer, autumn and even to Christmas (click on small pic for date). Golden and scented it attracts every kind of butterfly, moth, hover fly (that eat your aphids), honey bees, bumblebees, etc. If you have room for only one buddleja, this should be the one you choose.